Greg Hettinger is back in Philly after an almost peaceful time on the west coast during his rehab. He's trying to get back to a normal life and away from his Black Hood vigilante ways. It all seems to be working, a new partner, a new beat, and a good friend in Jessie. As much as things change the more they stay the same as this new arc proves. Duane Swierczynski could have easily thrown Greg right back into action as the Black Hood. Who would blame him? The Hood is a relentless pursuer of justice that uses his wits and brawn to get answers. Instead, Swierczynski lets Greg be human with all his fragility as he adjusts being back on the street. He gauges his effectiveness in uniform and his scarred face. It's a humbling and disappointing venture as he loses his confidence. Swierczynski understands a hero is only as strong as his flaws and how he overcomes them. It certainly makes the cliffhanger more poignant. Michael Gaydos returns to art duties after Howard Chaykin did the one-shot issue six. After Chaykin's bright and sunny tour in California, the contrast of Philly's dark, shadowy landscape is all Gaydos. His fuzzy, bleak, panels are almost comforting to see again knowing so much suspense lurks in the darkness. The noir crime drama is ready to launch another exciting arc. 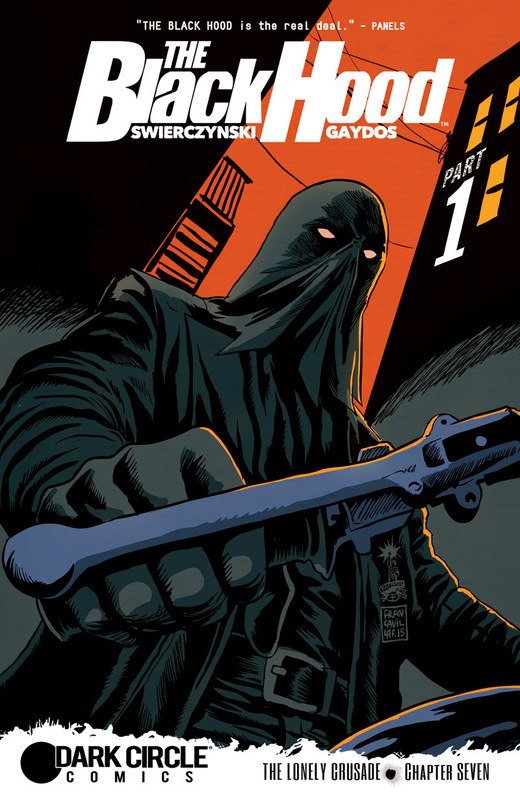 'The Black Hood' is about a man dealing with demons on a constant basis. He gives in to his impulses, succumbing to what makes him feel alive and relevant. Swierczynski and Gaydos make this title a joy to read because they respect their hero enough to let him grow, fail, succeed, and fail again. It makes for an exciting crime drama to read. Welcome back, gentleman.